What's underway in Greece is a historic clash between the exploited and their exploiters. Greece has been the European country hardest hit by the global crisis unleashed following the 2008 financial crash. It is against that background that the Greek workers and social movements have sustained the highest levels of resistance to austerity and an increasingly authoritarian state anywhere in Europe. That has combined with the collapse of the stabilizing, parliamentary political structures cobbled together when Greece emerged from dictatorship 40 years ago. The result is extreme political polarization. For four decades, a country which had recently experienced civil war between the radical Left and a highly authoritarian Right saw uninterrupted rule by the center-left and center-right, the Panhellenic Socialist Movement (PASOK) and New Democracy. In the 1990s, Greece joined the twenty-first century project of the euro. More profoundly, the battlelines in Athens today are about more than the conventional politics of who will form a government, its policies and prospects. They center on the conventions of politics themselves — whether there can be an alternative to soul-destroying corporate capitalism, whether politics is to remain but a plaything of a detached caste of haughty timeservers or is to be itself democratized as part of a radical transformation of society as a whole. So while there are fruitful comparisons to be made between the prospects of a Syriza-led government following the election on January 25 and the experiences — good and bad — of the reforming governments of Andreas Papandreou in Greece or of Francois Mitterrand in France in 1981, something else is in the air. It is the hopeful melody of forty years ago when dictatorships fell and everything seemed possible. A Greek friend once described to me what it was like coming into the socialist movement just a few years later, in 1980. It’s from that standpoint that I am sending these dispatches over the coming weeks. And I’m starting today with the following background note. So all the major news organizations are upping their coverage of all things Greek. The business paper of record, the Financial Times , is introducing daily its readers to parties such as Dimar (just as it enters the dustbin of history), explaining the minutiae of the Greek political system, and parsing the speeches of Syriza’s Alexis Tsipras and other Greek figures. Two dangers face coverage from the Left. One is to ignore the political developments, maneuvers and establishment interventions which serious mainstream journalism is overly fixated upon. The other is to become a left version of a White House correspondent and to lose sight of the clash of great social forces — of the sentiments, views and hopes of the mass of working people — on which even the most opaque passage of a political leader’s speech or the most arcane of electoral stratagems turn. Underway now in Greece is a historic clash between the Left and the Right, between — as Malcolm X once put it — the oppressed and the oppressor, the exploited and the exploiter. The first 250 MPs are allocated proportionately to the share of its vote to each party with more than 3 percent. Additionally, a “bonus” of fifty seats is given to the party which comes first. The bonus rule was introduced to avoid coalitions, which would historically have given parties of the radical left some leverage, and to corral electoral politics along the lines of a two party system headed by the conservative New Democracy and the social-democratic Pasok. So 151 MPs are required to form a majority government. The outgoing government — a coalition of New Democracy and Pasok — had just 153 MPs. Such is the decline of the mainstream center. There is a great premium on coming first in the election, even if that does not in itself provide enough MPs to govern alone. The party which comes first is constitutionally entitled to have the first opportunity to form a government, by including other parties if necessary. Today, Pasok might not cross the 3 percent hurdle for representation in the parliament. To repeat – the historic party of Greek social democracy could be out of parliament. Andreas Papandreou was from one of the great dynasties which dominated Greek politics last century and which were as important as ideology in the formation of governing alliances and political parties. The other — the Karamanlis clan — had the New Democracy franchise. When Andreas broke from the liberal center to form Pasok he could rightly claim that he was justified in splitting the center bloc against the monarchist Right because he was giving a genuine voice to the social democratic Left, independent from the liberals. George is providing a voice only for the Papandreous. And it will not be heard beyond their own parlor. Complacent social democratic leaders elsewhere should take note. For a time Popular Orthodox Rally (LAOS) – equivalent in Britain to something between Ukip and the British National Party – was in the governing coalition. Implementing austerity brought popular retribution to the national populists. That’s testament to the inspiring anti-fascist and anti-racist movement in Greece, including my friends in the anti-fascist KEERFA coalition, with Pakistani and other immigrant communities at its center. The old saw about the socialist left was that we are always so fragmented and prone to splits. In Greece it is the center and center-left that comprises groupuscules. Its leading force now is essentially a media confection called The River (the 1980s British Social Democratic Party minus the gravitas and onetime support). It stands for nothing except for an idea — or rather the ghost of an idea — of something called the center. Greek politics is now polarized along two axes — left and right, and pro- and anti-memorandum. To its left is the Communist Party (KKE), which has for the last few years pursued a radical line, eschewing previous policies of broad “national democratic alliances” in favor of revolutionary rhetoric and calls for full-blooded socialism. It is polling around 5 percent. The Financial Times and other news organizations are perhaps mindful of their readers’ nerves by introducing piecemeal the fact that were the prospect of a radical left government not bad enough, there is also in Greece a mass, combative, extra-parliamentary left with formidable youth following. And it has elected councillors too. In a recent vote of confidence in parliament he was content to allow the government to be represented in his absence by a notorious fascist who jumped from the LAOS party to New Democracy. The space on the Greek political spectrum which belonged to the center-right is now occupied by something even more virulent. And to its right stands the Golden Dawn, which seeks to provide shock troops against the labor movement and left on behalf of the oligarch industrialists while masquerading as an anti-memorandum, popular force. In the rest of Europe the distinction between a left government opposing austerity and a “national unity” government opposing eurozone measures but on a national-capitalist basis is purely hypothetical. The pace of political developments in Greece makes the distinction real and present. It is part of the calculations of the elite in Greece and their hirelings, not an academic or sectarian debate on the Left. So yesterday, for example, was the closing day for the registration of lists of candidates. The parties draw up the lists, which the electors then vote for. So party apparatuses have a lot of power in deciding who will run. The lists are also a mechanism to draw in backing or set a political orientation by including non-party figures to attract other bases of support. The system also enables career politicos to engage in an unseemly rat-run, jumping ship in the hope of saving their careers. So Angela Gerekou — an actor and wife of a well-known singer — was, until Monday, a loyal Pasok MP. Now she will stand on the New Democracy ticket. 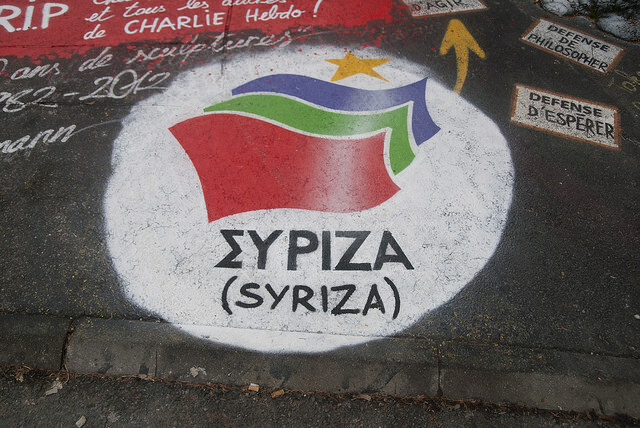 There’s no soul-searching over the Greens decision not to stand their own list but to be part of Syriza’s. That’s good news. But a populist MP of the Independent Greeks has also been accepted on to the Syriza list, provoking some controversy. The answer cannot be found in abstract appeals to “principle” — on principle the Left seeks both unity among itself and breadth of reach beyond its ranks. Answers will emerge from the actual course of this historic election campaign in Greece and what it represents. Last night Samaras — wallowing in the blood shed in Paris — issued a set piece call to rally the Right. Speaking in Corinth, Alexis Tsipras will respond today from the Left. Kevin Ovenden is a UK-based political activist and writer. His dispatches from Greece are being funded by Philosophy Football through the sale of t-shirts.